Liverpool have reportedly set an asking price of £136million for Sadio Mane to leave the club this summer amid transfer rumours linking him with Real Madrid and Barcelona. The Senegal international is in superb form at the moment and it seems unsurprising there could be growing interest in securing his signature from Europe’s elite. Still, Mane will not come cheap as Don Balon claim Liverpool would demand Philippe Coutinho-like money for their in-form forward – around £136m. 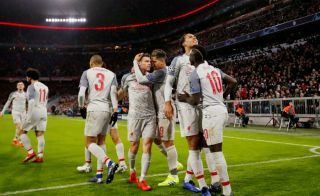 It was claimed by AS last summer that Zinedine Zidane was a fan of Mane, who scored for Liverpool against Real Madrid in the 2018 Champions League final. Meanwhile, a more recent report from Don Balon has linked the 26-year-old with Barcelona, with the Spanish outlet stating Lionel Messi is a big fan of the player. It remains to be seen, however, if anyone will be quite ready to go and splash out as much as £136m for the former Southampton man. Some could do well to look at Liverpool’s attacking players and not rush into spending big on them, with the form of Mane undoubtedly up but the form of Mohamed Salah and Roberto Firmino down, while Coutinho has struggled since leaving Anfield for the Nou Camp last season.